All writers struggle at some point with their first full-length manuscript. But the right spark, whether a book, a mentor, a writers’ conference or a combination of all three, can set us back on track. Rashmii’s writing table – I love the colourful stickers. A few weeks ago I posted an email from a Papua New Guinean reader giving feedback on Inside the Crocodile: The Papua New Guinea Journals. Today, I heard from Rashmii Bell again. This time, sharing progress on her own writing and enclosing this photograph of her desk. As you know, for the most part of this year I’ve been trying to write my first book. 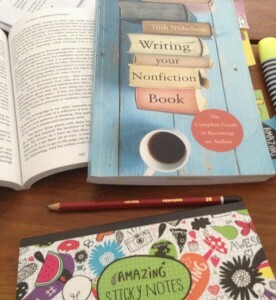 I ordered your Writing Your Nonfiction Book as my ‘manual’ and was quite excited when I first received it. I started highlighting and jotted out a few notes to guide how I would start writing. I’d done a half-decent attempt at a chapter outline. But it was not long before I was unable to resist the urge to dive in and start writing out a few paragraphs as they came to my mind. I put my ‘manual’ away in the drawers and got to writing. Big mistake! I’d mapped out a few rough chapter themes and slotted these paragraphs here and there. That was between April and May. I had done the bare minimum since then other than researching…which I admit has been more procrastination than anything. The idea of writing your own book is really exciting but I’ve found it can be quite lonely and maintaining momentum and motivation is extremely challenging. You do discuss this in your book (only realised after I pulled it out of the drawers!). Just before the Brisbane Writers Festival (early September 2016), I’d made a firm decision to wholly commit myself to writing my first draft in full by this year December 31. Through the kind assistance of my writing family, @PNGAttitude, I’ve acquired a mentor to keep regular track and encourage my progress as I work towards first and final draft. Fast forward to September and my involvement in the four-person panel for the PNG Writers session at the Brisbane Writers Festival 2016 and seeing two of my fellow panellists signing their own books for customers has really motivated me to charge on to December 31. I’d met with my mentor during the week and he’d given me a two week deadline to submit my outline to him. I came home and got both your books out from the drawers: Writing Your Nonfiction Book as well the book you’d kindly sent to me: Inside Stories for Writers and Readers. [ Not currently available]. Using these two books I managed to write a comprehensive plan within two days and submit it to my mentor. Now, I make it a point to put them as the first items of writing materials on the table, open to the very page as I sit down to write each day. Following Writing Your Nonfiction Book page by page is extremely wise for a first timer. It is logical and non-overwhelming. I found rereading the section on ‘Determining your theme’ (pp. 20-22) developed a more substantial outline for each chapter. I look at my half decent attempt of an outline and the few paragraphs I’d written initially and realised how confusing my message might be if I kept at rambling with whatever thoughts came to me. Chapter 5 (Voice, Language and Dialogue) in Inside Stories has been most helpful in helping me resolve this. I really appreciated your discussion on one’s personal chorus of voices and potential tones. The idea of an ‘inner chorus’ – I’d never been able to articulate until reading those paragraphs on pages 98-101. I feel more comfortable in working on each chapter now. The combination of Pico Iyer’s quote and what you described as your approach when you write nonfiction is what I think will work best for me to get out as much as I can when writing each chapter. Thanks so much for your time Trish. I really appreciate you receiving my thoughts on your books. Have a great week! Thank you, Rashmii. I’m delighted to be taken out of the drawer and into the light 🙂 Happy writing! And I hope you will keep us posted on your progress. You can follow Rashmii on Twitter @amoahfive_oh and I’m sure she will create her own blog when she reaches Chapter 9 of Writing Your Nonfiction Book about setting up an author platform. We will watch her space.